Arthur Miller’s Death of a Salesman, published in 1949, won the Pulitzer Prize for Drama and the Tony Award for Best Play the same year. It premiered on Broadway in February of 1949 and ran for almost 800 performances. It is still considered one of the best examples of 20th Central American Drama. Death of a Salesman has been adapted into multiple films around the world. There have been numerous television adaptations and a radio play based on the work. It continues to find receptive audiences all over the world to this day. The play has been critically acclaimed around the world. Some have even seen a tendency toward Marxist critique in Miller’s play, although this interpretation has been largely from European audiences and readers. These critics have identified the fundamentally alienating features of modern work as they are played out in the life of Willy Loman. Other critics have taken a more psychological approach. They see a man who built his life around illusions and dreams. As they dreams unravel, his sense of self unravels also. The play strikes a nerve for two reasons. It interrupts the myth of the American dream which is something of a foundational myth in the United States. Miller’s play shows a dark light on this ideal and draws it into question. Second, the play is tragic, but it lacks the features of a true Aristotelian tragedy. The hero, Willy Loman, is not a great man brought low. He is a nobody who is fractured and destroyed by his own illusions. Miller’s play continues to move contemporary audiences. Productions of play are still coming out and the numerous films and television versions attest to its enduring popularity. 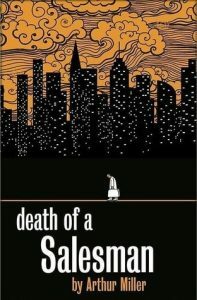 Death of a Salesman is, of course, required reading in any American literature course, so central is this play to 20th Century American literature.